While gum recession is a common occurrence related to aging, it’s not just an “old person’s disease.” It can happen to anyone, even someone with a relatively healthy mouth. And this detachment and shrinking back of the gums from the teeth may not be a minor problem—your dental health is definitely at risk. Here then are 4 things you should know about gum recession, and what you can do about it. The most common cause: periodontal (gum) disease. A bacterial infection triggered by built-up dental plaque, gum disease weakens the gums’ attachment to teeth that leads to recession. To help prevent it, clean away plaque with daily brushing and flossing and visit a dentist regularly for more thorough plaque removal. If you already have gum disease, prompt treatment could stop the infection and reduce any resulting damage including recession. …But not the only one. There are other factors that contribute to recession besides disease. In fact, it could be the result of “too much of a good thing”—brushing too hard and too frequently can damage the gums and lead to recession. You might also be more susceptible to recession if you’ve inherited thin gum tissues from your parents. 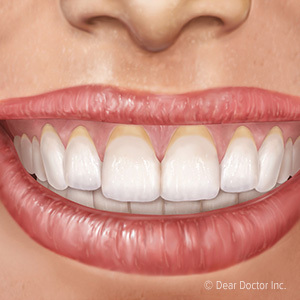 Thin gums are at increased risk of recession from both disease and over-aggressive hygiene. Best outcomes result from treating gum disease and/or recession early. The earlier we detect and treat a gum problem, the better the outcome. See your dentist as soon as possible if you see abnormalities like swollen or bleeding gums or teeth that appear larger than before. Depending on your condition there are a number of treatment options like plaque removal or techniques to protect exposed teeth and improve appearance. Grafting surgery could regenerate lost gum tissue. While with mild cases of gum recession the gums may respond well to treatment and actually rejuvenate on their own, that might not be possible with advanced recession. We may, however, still be able to restore lost tissue through grafting. Using one of a number of techniques, a graft of donor tissue can foster new replacement growth. It’s a meticulous micro-surgical approach, but it could be a viable answer to extreme gum recession.